Bleaching Chemicals are usually based on peroxides which do not contain chlorine such as sodium percarbonate, hydrogen peroxide, and sodium perbonate. Bleaching chemicals are industrially as well as domestically used for, whitening clothes and removing stains from textiles. Bleaching chemicals are as well used in the pulp and paper industry for the bleaching of wood pulp used in making paper. Bleaching chemicals are also used in horticulture for killing weeds, removing mildew and increasing longevity of cut flowers. Bleaching agents function by interacting with many organic chemical compounds to turn them colorless. Chlorine is a powerful oxidizing agent present in a number of bleaching agents. Bleaching chemicals are also capable of irreversibly denaturing and destroying many proteins that make them versatile disinfectants with good antimicrobial efficiency. Reducing bleaches have niche uses such as bleaching wool. The very earliest application of bleaching chemicals involved spreading out clothes and fabrics in a bleach field that were whitened by the action of water and the sun. Many research and development in various end-user industries has resulted in the discovery of new applications of bleaching chemicals in the past that is predicted propel the market over the forecast period across the globe. Bleaching Chemicals Market is anticipated to record a CAGR of 5.9% over the forecast period. The bleaching chemicals market is estimated to value at 3.5 billion by the end of the forecast period. Moreover, the many advantageous properties of bleaching chemicals are exploited in the field of textiles and water treatment now and then. New uses for bleaching chemical derivatives are discovered on regular basis which is expected to drive the bleaching chemicals market rapidly. Currently the global bleaching chemicals market is observing vibrant growth owing to increasing demand of polymer foams in the market. Advances in food and beverage industry in the past few years and growing technological expertise are projected to drive bleaching chemicals market besides the wide range of functions of bleaching chemicals in an immense range of products such as face bleach masks, laundry bleaches, hair bleach serums and more during the forecast period. On the basis of regional platform, global Bleaching Chemicals market is segmented into five major regions including North America, Europe, Asia Pacific, Latin America and Middle East & Africa region. As a precursor to decolorizing agent in textile industry, Asia-Pacific is panned to observe substantial bleaching chemicals market growth on account of rising bleaching chemicals usage. On the back of multiplying bleaching chemical uses in growing end-use industries such as agricultural, construction, pulp and paper, electronics, industrial and water treatment, Asia Pacific is budding as a regional Bleaching Chemicals and its derivatives consumption market. North America is expected to follow Asia-Pacific in terms of consumption due to expanding bleaching chemicals requirements in food & beverage and water treatment industries. The rising demand for bleaching chemicals and its products for various processes in textile, food and beverage, construction industries are expected to drive the market rapid over the forecast period. The growing use of bleaching chemicals in bonding with glass ionomer cements and resin-modified glass ionomer cements for teeth whitening in healthcare in industry is predicted to drive the market robustly over the forecast period. 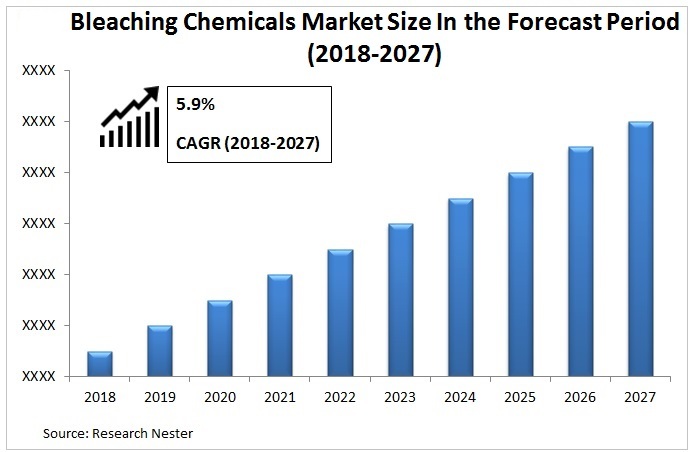 Rapid economic development with thriving manufacturing sector on account of rising urbanization as well as industrialization across the developed and developing countries is expected to boost the bleaching chemicals market across the globe. The application of bleaching chemicals on the back of their properties such as homogeneous catalysis, ozone fading, optical brightening and various other factors are expected to showcase a decent growth of the bleaching chemicals market during the forecast period. The use of bleaches as disinfectants can help in prevention and treatment of gingivitis. The periodontal disease can be treated at an affordable, efficacious and safe manner by the use of sodium hypochlorite as an antimicrobial agent. However, ingestion of these chemicals, contact with eyes or skin and breathing of fumes of bleaching chemicals can lead to harmful health effects resulting in the damage of various organs such as stomach and esophagus which is predicted to restrain the bleaching chemicals market over the forecast period.